To see a full breakdown of your trip costs, log in and click to see details of the relevant trip under the 'Trips' tab. The car's hourly and daily rates are set by the owner. The car's hourly rate applies for each hour you have the car, until you reach the daily rate (usually 5 hours). The daily rate is the most you will pay for the car for any 24 hour period. It's important to take the distance charge into account when estimating the cost of your trip. The distance charge will be 21c, 33c or 45c per kilometre and is chosen by the car's owner. This covers the fuel you used and compensates the owner for all of the other running costs associated with your driving. If you are on the free 'Featherweight' membership plan, you will pay a booking fee for each trip. You may also choose to reduce your Damage Cover Liability for an extra hourly or daily fee. Heavyweight members pay $19 a month. They do not pay any booking fee, and get a reduced damage cover liability for every trip. If you cancel or change your trip, or return the car early, you may see a charge for unused or cancelled time. See a full explanation of these charges. For your first trip, we'll charge a $150 deposit at the time you book your trip. Your distance charge will be deducted from this amount and the balance returned to your Car Next Door account. Why was I just charged when my trip ended some time ago, or hasn't started yet? Your card is charged for the time and distance of your trip on the night that your trip finishes. However we don't get notified of your tolls until some weeks later, so these are charged separately in your monthly invoice. For trips longer than seven days, we will charge part of the total cost in advance and may take progress payments throughout the trip. But it would've been cheaper with a rental car! 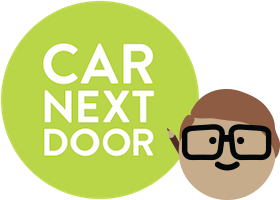 Overall, renting a neighbour's car is still cheaper than most car rental companies when you take into account fuel, excess reduction and daily fees - plus, you get the convenience of being able to pick up and return the car at a time that suits you, without having to head to the rental car depot. To see a comparison of what different kinds of trips might cost you, check out this cost comparison info.